Financial service providers must process many different types of electronic payment transactions such as credit, debit, prepaid, ATM, POS, and mobile transactions. As new payment mechanisms have entered the market, companies have been required to access data from a growing number of transaction sources and process these transactions using a variety of back office systems. As a result, many companies are finding their back office environments to be difficult to manage, costly to operate, and susceptible to performance issues and errors. 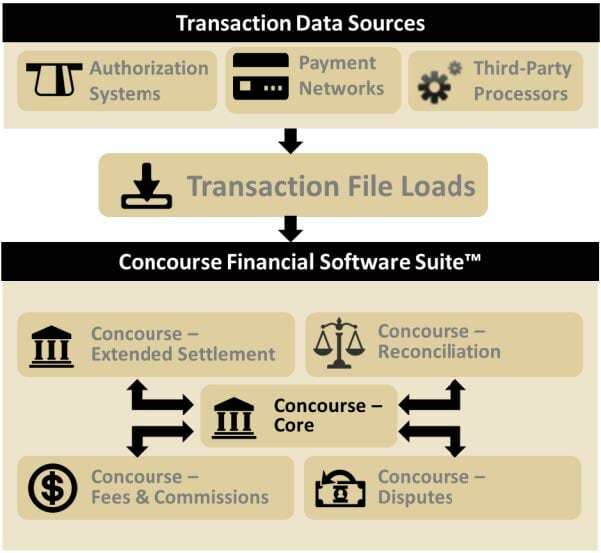 The Concourse Financial Software Suite is designed as an integrated back office system, but its modular design allows companies to select and add appropriate business services as they are required. Here is an illustration of data being automatically loaded into the Concourse system and shared with the Concourse modules via Concourse – Core.